College health counselors are seeing a drastic rise in mental health disorders in their students. According to Judith Green, director of Ramapo College’s Center for Health & Counseling Services, the issues range from transition adjustments to more serious psychiatric disorders. Green blames the rise of mental health disorders on a lack of frustration tolerance and delayed gratification thanks to generations that have had instant access to just about everything. To build on those frustrations, Green said seniors don’t have jobs lined up yet and are concerned about paying for college. While these issues are sending more students to health counselors, they aren’t the only ones who can help students rise above their frustrations. As a career counselor, you can help by preparing students for the not-so-instantly-gratifying job search. You know most students will be just fine. They’ll eventually graduate, find their footing, get a job, and forget how unbearable they felt the job search was. However, at this moment, they have the rest of their lives ahead of them and it’s terrifying. Nothing is happening as quickly as they want, making them feel stagnant during a time when they should be moving forward. Let your students know they have a place to go where they can voice those anxieties without judgment. Simply saying, “It’ll be OK” and moving on downplays their emotions and won’t help them overcome their struggles. Instead, let them know their frustrations are heard, understood, and validated by empathizing with them. Your students need more than an “It’ll be OK” to get them through the #jobsearch. Explain that these feelings are normal and that they’re not alone. From there, ask what they feel their job search timeline should look like. Note what frustrations are actually stemming from unrealistic expectations. Show them they’re not behind or slow, and that this is the natural process. Many employers are working diligently on shortening their time to hire. However, the type of instant gratification students have become accustomed isn’t part of the job search — yet. When it comes to students who are easily frustrated by the job search, a lack of instant gratification becomes a major issue. They look at their goal list with one box to check: “get a job.” When this doesn’t happen immediately, they have trouble coping, get frustrated, and even become depressed. Start by giving your students smaller job search goals. As each one is accomplished, they’ll receive the gratification they crave. This takes the pressure and focus off of the overarching goal of landing a job and gives them smaller, more productive ones to check off their list. Also, help them create their cover letters and resumes. If they need more experience, share a few volunteering and internship opportunities. Show them how each task will get them closer their first ‘real’ job. Technology is largely to blame for students’ rising frustrations, so why not let it help solve the issue? Students are wizards when it comes to their devices, and their smartphones and tablets have even become a security blanket. Make a list of job search apps and tools to give students a sense of comfort and accomplishment. Tools like MyPerfectResume and Cover-Letter-Now will help them perfect their application documents outside of your office. For the job search, an app like Switch gives them a fun and easy mobile experience. Remember, instant gratification is something your students crave. Thanks to smartphones and social media sites, they tie their entire self-worth and confidence to an immediate response. So, continue nurturing them and frequently complimenting their traits and skills. Want more career services tips? Sign up now and receive our newsletter! 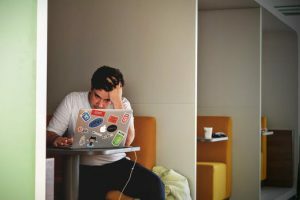 The post College Students are More Frustrated Than Ever, But You Can Help appeared first on Blog Job Hunting Career Management Solutions | CareerShift.